Pictured from left to right are: Dr. Piet Bekaert, anesthesiologist; Dr. Hasan Ali, founder and medical director of Hasan Surgery Plastic Reconstructive and Aesthetic Surgery Center; Anam Hasan, managing director; Catherine Rose Romano, RN and Arlene Guevara, RN. 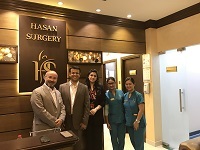 Hasan Surgery Plastic Reconstructive and Aesthetic Surgery Center is in Dubai Health Care City and is accredited by AAAASF. The American Association for Accreditation of Ambulatory Surgery Facilities (AAAASF) has awarded accreditation to its first facility in Dubai. Dr. Hasan Ali is a plastic surgeon specializing in reconstructive and aesthetic surgeries. He is founder and medical director of Hasan Surgery Plastic Reconstructive and Aesthetic Surgery Center located in Dubai Health Care City, Dubai UAE. He also has another office in Riyadh, Saudi Arabia. He holds a current license to practice and perform a surgery in U.K, Ireland, Dubai, Saudi Arabia and Pakistan. As one of the most popular cities in the world to visit, Dubai already welcomes nearly 10 million visitors a year. According to MasterCard’s latest Global Destination Cities Index (2013), Dubai is likely to become the seventh most popular destination city in the world after the likes of Paris, London and Bangkok. The medical travel website Patients Beyond Borders, reports that Thailand is still the most popular destination for cosmetic surgery tourists, followed closely by Malaysia, both offering services at half or even a third of developed country costs. Dubai authorities have introduced a new three-month medical tourist visa, which can be extended twice for nine consecutive months. The government, in a bid to not only attract medical visitors but acquire the best practitioners, has also started granting visiting doctors short-stay visas for as little as one day. To become accredited by AAAASF, internationally accredited facilities must comply with standards governing professional training, operational safety and the physical layout of the facility. Patients undergoing surgery in an accredited operating room should be assured the same level of care and safety preparedness as those receiving care in a hospital. Facilities with nearly any surgical specialty are eligible for accreditation under AAAASF’s international program. Find out as much as you can about the procedure, the medical specialists required for the procedure and the facility where you will have the procedure performed. Look for a qualified physician or medical specialist. Look for a fully equipped and safe facility. Be sure you are an appropriate candidate for the type of procedure you are considering. Review AAAASF’s Patient Safety Fact Sheet for ideas on what to ask before, during and after your appointment. Should Medicare allow total joints in ambulatory surgery centers?